Harwich is not mentioned in the Domesday Book so at that time if anyone lived there it must have been a very small settlement. (The name Harwich is believed to be derived from the old words here wic, meaning army camp because the Danes camped there in the 9th century). However there is an entry for Dovercourt. It was a little village with a population of about 120. The inhabitants were peasants who farmed the land around a cluster of wooden huts. Harwich grew rapidly and in 1318 it was given a charter (a document granting the townspeople certain rights). In the later Middle Ages Harwich was a busy little port. At that time England’s main export was wool and bales were sent from Harwich. The main import was wine (the drink of the upper class). Furthermore in Harwich there were the same craftsmen found in any town such as carpenters, brewers, butchers, blacksmiths etc. then at the time of Henry VIII strong defences were built at Harwich. Three forts were erected. At that time Harwich was a busy fishing port with a population of about 800. In 1604 James I gave Harwich a new charter. As well as weekly market Harwich was allowed 2 annual fairs. In those days fairs were like markets but they were held only once a year. 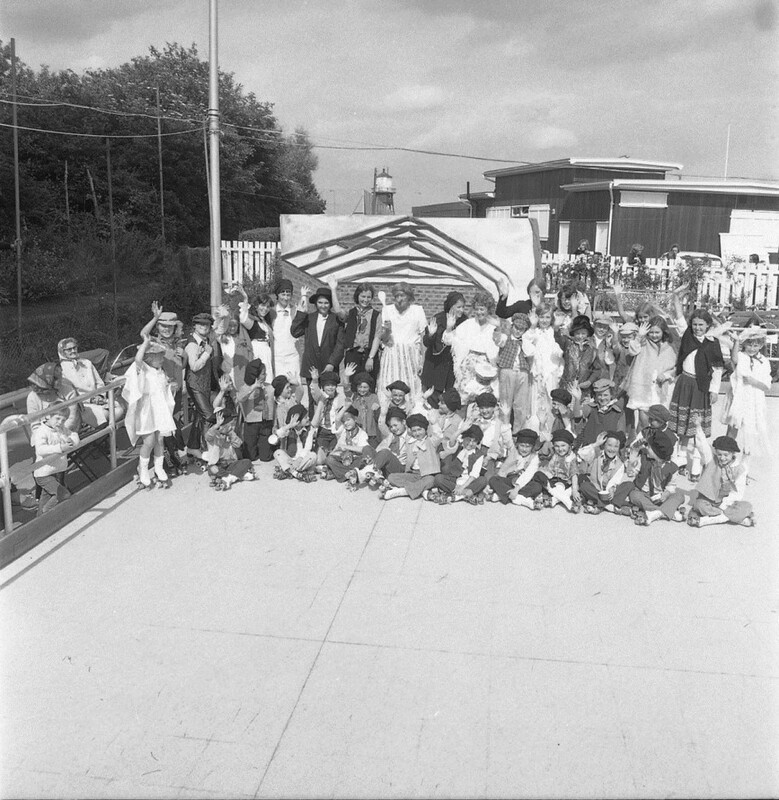 People came from all over Essex to attend a Harwich fair. In the 17th century Harwich continued to flourish. Shipbuilding was a major industry in the town. Harwich became an important naval base in the 1660’s, and Samuel Pepys was First Secretary to the Admiralty at this time and also the town’s M.P. The Navy Yard was the original site of one of the town’s most impressive surviving monuments, the Harwich Crane, dating to about 1667. The unique Treadwheel Crane, built at the shipbuilder’s yard in 1667. It was operated by two men walking inside twin wooden treadwheels and was in use until the early years of the 20th century. It was re-erected on Harwich Green when the old shipyard was dismantled in 1928. In the 18th century quieter times returned but civilian shipbuilding continued in Harwich and fishing was still an important industry. Harwich was also a still a busy little port. However the town did suffer from flooding at intervals. In the 1720s the writer Daniel Defoe visited Harwich and he said it was ‘a town of hurry and business, not much of gaiety and pleasure; yet the inhabitants seem warm in their nests and some of them are very rich’. Defoe was also impressed by Harwich harbour. he said it was ‘able to receive the biggest ships and the greatest number that ever the world saw together’.Harwich Guildhall was rebuilt in 1769. The urban structure of the Harwich peninsular has developed around three defined centres, each totally different from the others in both Character and layout.as they have followed one another in development so they are now saves out in a sequence along the narrow hook shaped strip of land. Linking them but also dividing them is the main A604 trunk road which terminates at Harwich Quay. Anyone who spends a little time exploring the quiet old streets of Harwich could hardly fail to be impressed by the wealth of buildings which recall the town’s past importance, as a trading port, a naval base, and as a bastion of Britain’s front line defences in times of war. Beneath the town’s street, however, lies a vast source of information which can enable archaeologists to trace human occupation much further back in time. The old town has long been associated with the sea, but it is not until one turns into West Street, almost at the very end of the narrow peninsular that one is aware that the sea is anywhere near, the town has developed around four main streets which run roughly parallel down to the quayside. Linking these together is a series of narrow streets and alleys. Subsequent development has softened the regularity of the street patterns, but not changed the basic town Structure. The entrance to Harwich old town is dominated by the High lighthouse which Stands at the south end of West Street. This 90ft. high grey brick tower was built in 1818 under the supervision of John Rennie Senior. built to replace earlier wooden ones. Belonging to General Rebow who became very rich by charging 1d per ton light duties on all cargoes coming into the port. But in 1836 Trinity House acquired the Harwich Lights from General Rebow for £31,730, there being 12 years and 5 days remaining of his lease. It is suspected that Rebow had become aware of the changing course of the channel. The lighthouses became redundant in 1863 for just this reason and the new cast iron lighthouses were erected at Dovercourt near the Phoenix Hotel. The High Lighthouse was sold for £75 and was used as a residence and Wireless Museum. 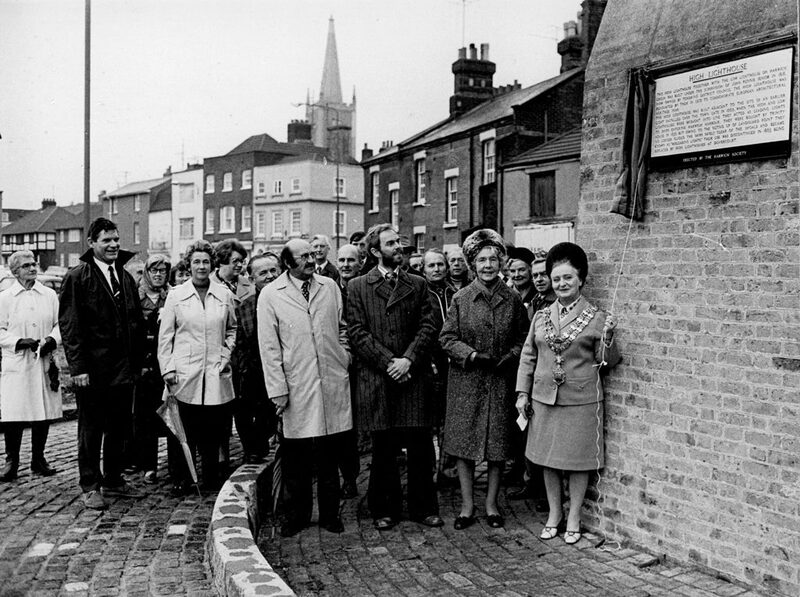 October 30th 1976 saw the unveiling of our plaque on the High Lighthouse at Harwich. The morning was cold and drear but it did not deter about fifty faithful members from attending the ceremony which was performed by the Mayor of Harwich, Councillor Mrs Georgina Potter, Also present were the Chief Technical Officer of Tendring District Council, Mr C. Bellows, and Mr Henry Lambon and Mr Tom Judson, chairman and secretary respectively of the Colchester Branch of the Royal Institute of British Architects. The restoration of the High Lighthouse was a joint undertaking of Tendring District Council, Essex County Council and the Colchester Branch of the R.I.B.A. to commemorate European Architectural Heritage Year, and was the first major undertaking of the new Tendring District Council to give a lift to depressed Harwich, and what an excellent job they have made of it! The widest and longest street in Harwich is West Street and it is particularly important since it is from this street that the town tends to be judged by casual visitors and ferry passengers. The guildhall is the only building in Harwich old town of outstanding merit on its own, it was rebuilt in 1769, the interior contains a good staircase and a Panelled court room. Opposite the guildhall was the Three Cups hotel which was built early in the 16th century on an L shaped plan and has a 17 century wing. Inside there is a late 15th century staircase, moulded beams and a late 16th century plastered ceiling. Perhaps the most pleasing townscape exists around the church of St. Nicholas .as one travels down church street ,the road gradually tapers From the guildhall, which is a string visual buttress, standing forward into The street ,causing ones view to stray. Pier Hotel & Great Eastern Railway Hotel. 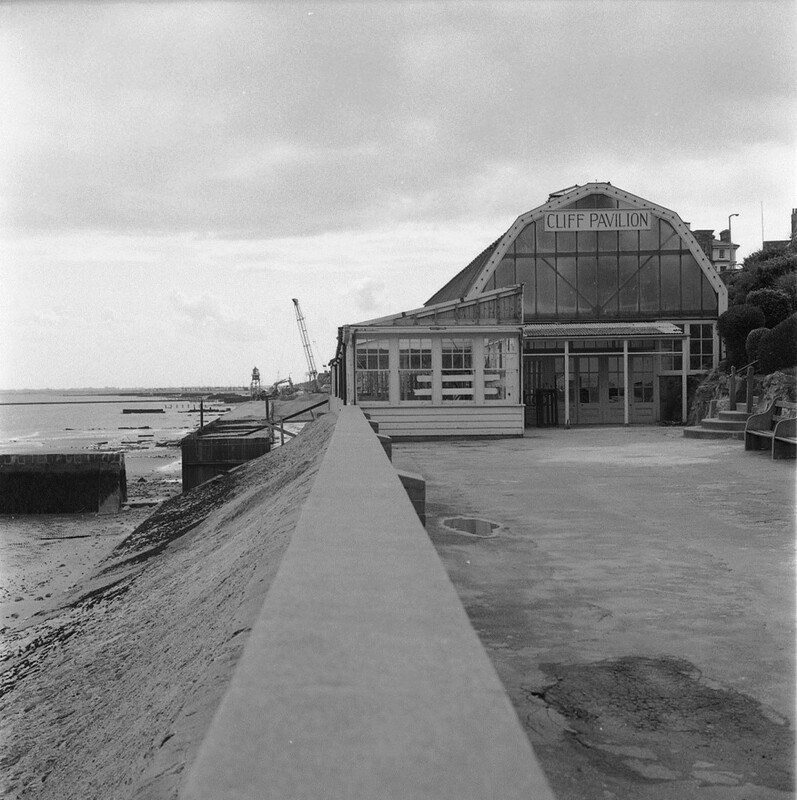 the quay was originally the ticket office for the continental packet steamers , and is an elegant and fascinating reminder of the early days of cross Channel travel. At the turn of the century the Fire Station was at the rear of the Three Cups Hotel with equipment consisting of a Shand Mason steam pump and a second smaller pump. The press commented: ‘The spectacle of a messenger running off to summon the brigade of 16, from 16 separate homes, is sure not more ridiculous than the old pump which, once working, won’t throw enough water to draw a fly a few yards.’ The hose, apparently, had so many leaks in it that it was useless. They did not have a single ladder at their disposal and had to borrow hoses from the GER and the Army. to their credit, the Council did act, and they recommended the building of a new fire station, ironically on the site of the disastrous Parson’s fire and the purchase of a horse-drawn steam engine. It was suggested that a horse-propelled fire engine be purchased and a fire station be built on the vacant land next to the new Electric Palace cinema where two cottages had been. A vacant house on the corner of Wellington Road and Kings Quay Street would become the station officer’s house. The council accepted Mr Newton’s tender to build the new fire station at a cost of £ 1041. The new fire engine arrived in November before the fire station had been completed. The new Shand Mason equipment could be fired up in seven minutes and was capable of throwing 300 gallons of water a minute, almost three times the amount of the old pumps. Following the destruction of some cottages belonging to the Corporation by fire in 1911, it was decided to use the £ 942 received from the insurance to build a new fire station on the site and lease the remainder for a cinema at £ 30 per annum for 60 years. 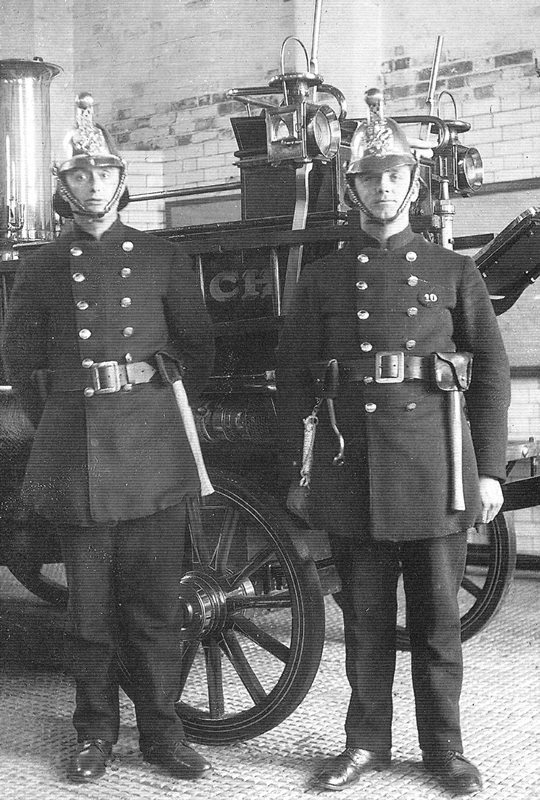 When the new fire station opened in 1912, Mr Dixon Hepworth became captain of the brigade which was equipped with the latest Horse Propelled Steam Fire Engine. It stood next to the Electric Palace. Until 1915 horses were hired to pull the engine, the council then bought two horses of its own for £ 50. This lasted until 1925, when the council sold the horses and bought a Dennis motor fire engine for £ 960. Bearded labourers sporting a helmet as their uniform, pulling hand pumps through the narrow streets, and smartly dressed “Keystone Cop style” firemen whipping up their horses in a frenzy of activity as the church bells sounded the alarm. 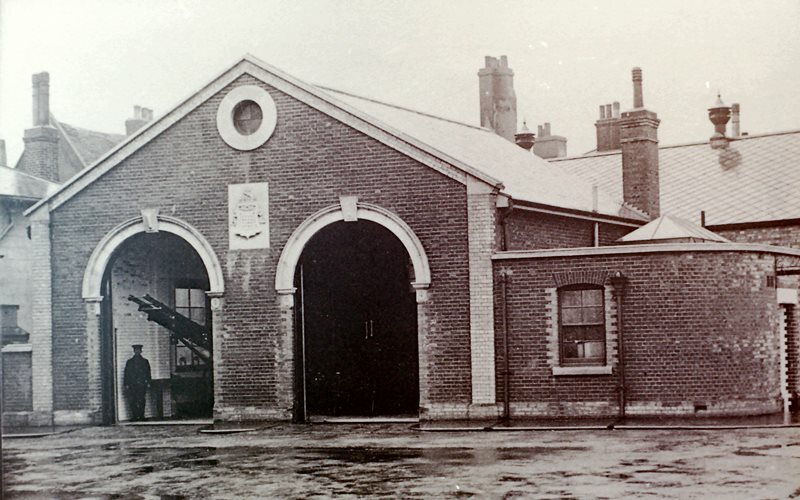 The old fire station on Cow-lane, Harwich, has seen them all, but now the borough’s final link with those far-off days of the early fire brigade has moved to a smart, new station in Fronks-road, Dovercourt. 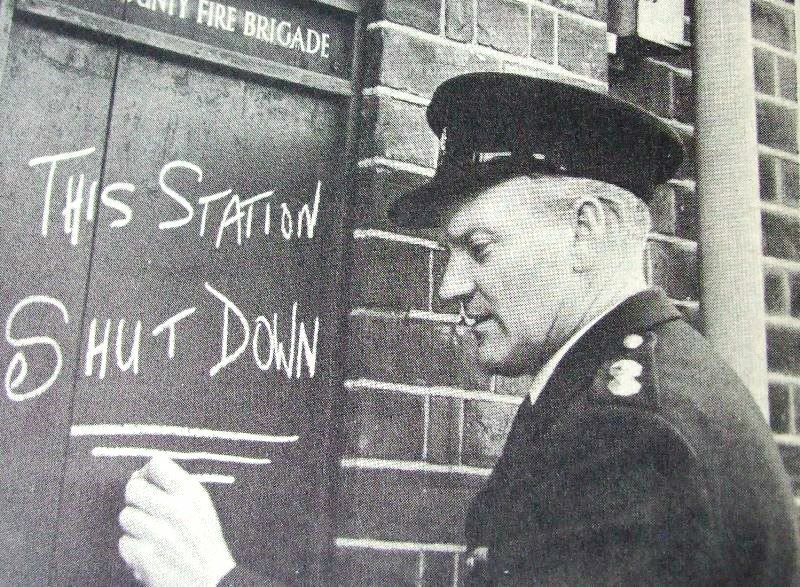 Station officer J. Howard, chalking up the sign which marked the official closing of the old fire station. In 1801, at the time of the first census Harwich and Dovercourt had a population of about 2,700. 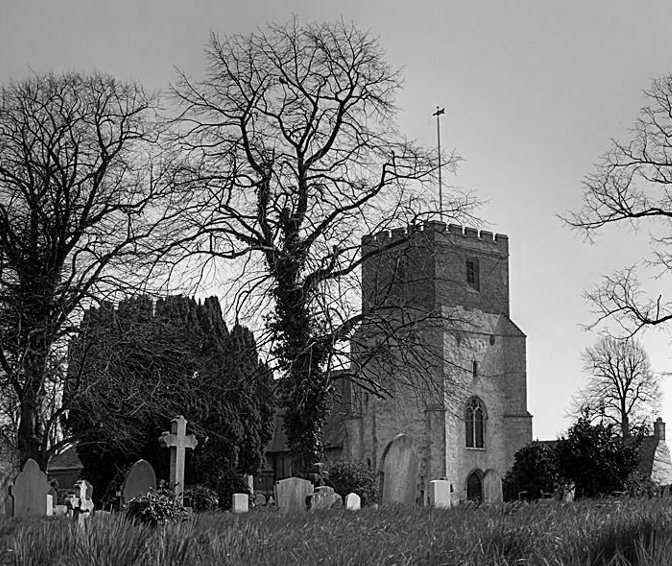 To us it would seem no more than a village but by the standards of the time it was a fair-sized market town. In the years 1808-1810 a redoubt was built to protect Harwich from the French. A lighthouse was built in 1818 and St Nicholas Church was dedicated in 1822. 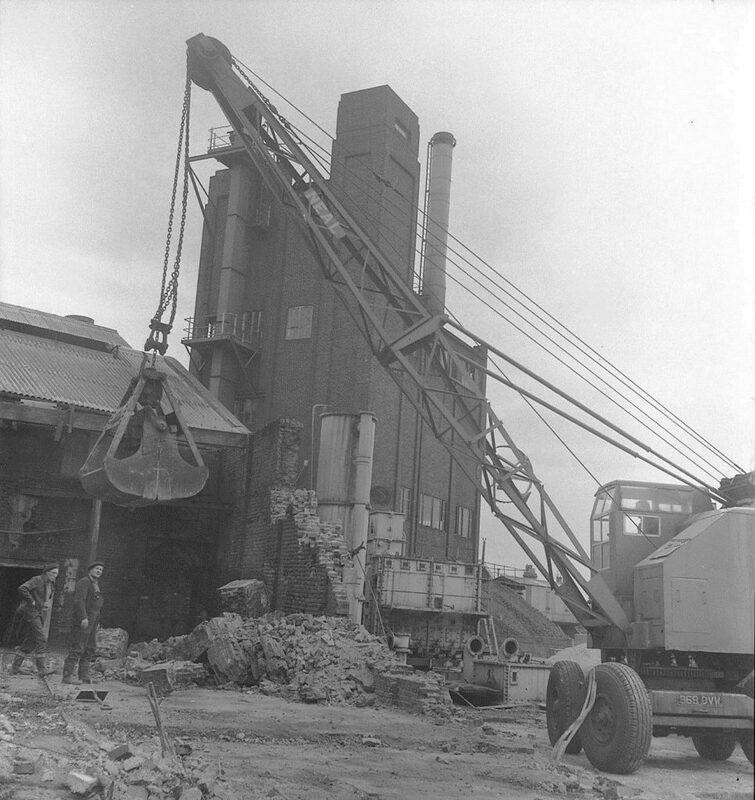 In the early 19th century an industry making ‘Roman cement’ flourished in Harwich although it had died out by the end of the century. On the other hand the railway reached Harwich in 1854 and steam ships began sailing from the port. Furthermore there were some improvements in Harwich during the 19th century. from 1870 Harwich was lit by gas and in 1880 the first sewer was dug. 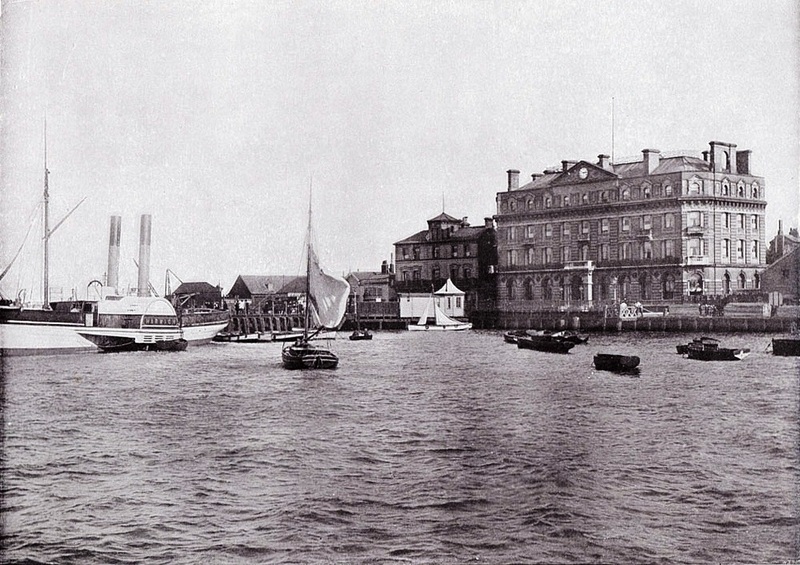 in 1887 Harwich gained a piped water supply. In the early 20th century the fishing industry in Harwich petered out but the port continued to thrive. Today Harwich is still a flourishing port. In the 20th century Harwich continued to grow steadily. By 1911 it had a population of over 13,000. By 1971 it was almost 15,000. 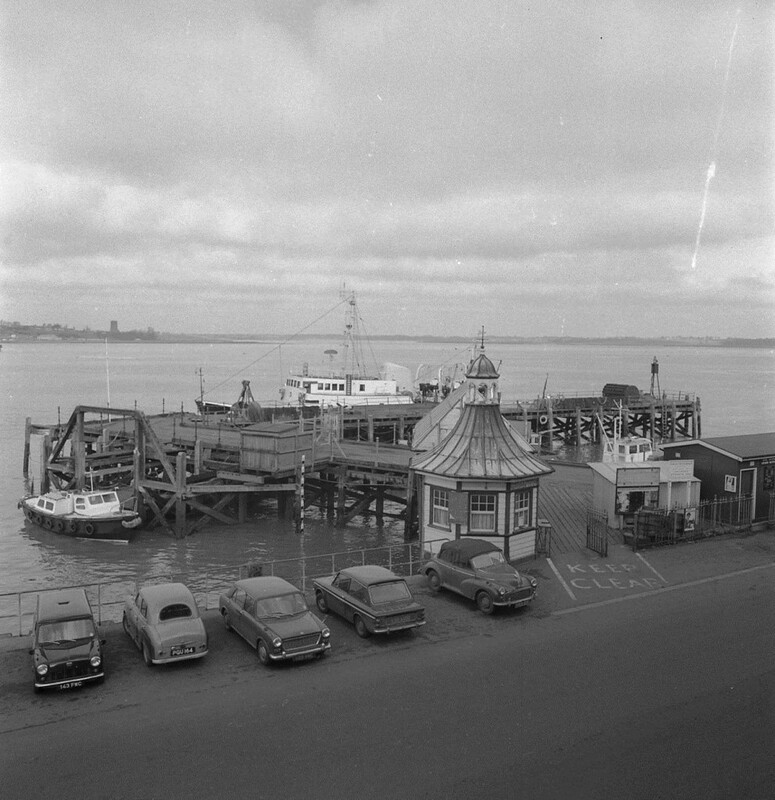 Today Harwich retains much of it’s history, maritime links and old buildings, such as the Redoubt Fort, High and Low lighthouses, and the Electric Palace Cinema. There are numerous lovely old houses to be seen along the narrow streets including the Foresters house which is said to be the oldest house in Harwich. The Redoubt was built between 1808 and 1810 to protect the port of Harwich against the threat of Napoleonic invasion. 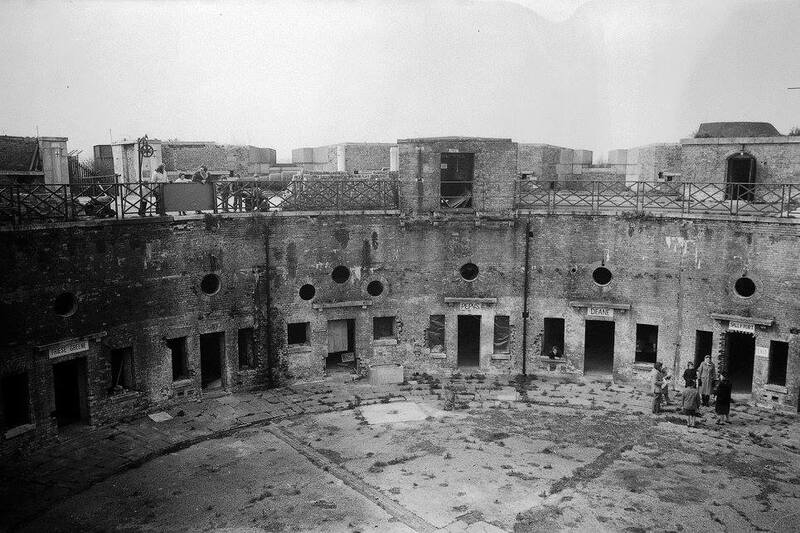 The Redoubt is of circular shape, approximately 200ft in diameter, with a central parade ground of 85ft diameter. Hoists were used to lift shells from the lower level to the gun emplacements. Though difficult to imagine as it is now surrounded by houses, when the Redoubt was built it was on a hill top with free views in all directions. A house was demolished to make way for the Redoubt, and a large elm tree – used by ships as a navigational mark was also removed. Originally armed with ten 24-pounder cannon, the Redoubt was remodelled in order to accommodate increasingly heavy guns, as technology and the perceived threat changed. In 1861-2, work was carried out to accommodate 68-pounder cannon, and the emplacements were strengthened by adding granite facing to withstand improved enemy artillery. Only a decade later in 1872, three of the emplacements were altered to take enormous 12 ton RML(Rifled Muzzle Loading) guns. In 1903, three emplacements received 12 pounder QF(quick firing) guns. 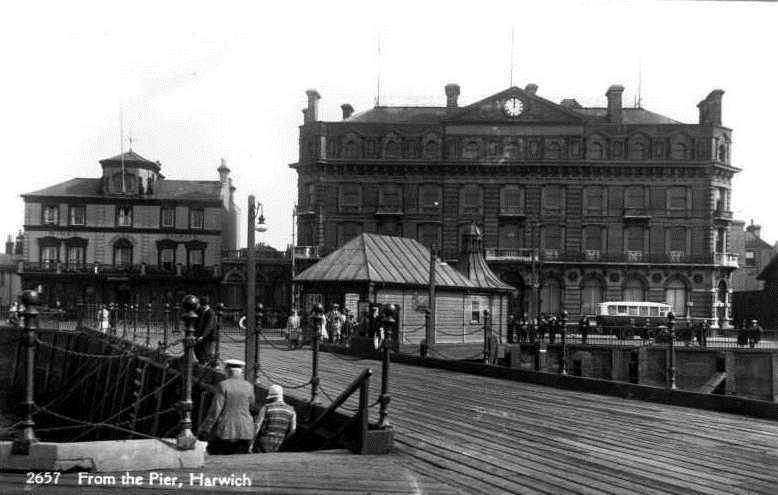 The importance of Harwich changed significantly with the arrival of the railway station in 1854 and later in 1883 when Parkeston Quay was opened. Probably it was the significance of the town to travellers and the increase in population which prompted the need to build such a substantial new Police Station complex. The site was designed as a self-contained law enforcement centre complete with court offices and accommodation for many police officers. The Basement was divided up into various rooms to house the resources necessary to run such a large complex. These included a Weights & Measures Room, 2 Wash Houses complete with toilets, Store Rooms, and a Bicycle Store. A block of terraced houses was created at the back and to the west of the Police Station which accommodated three married constables and one married sergeant. The accommodation was quite large, each house having a kitchen, pantry and living room on the first floor, two bedrooms on the second floor and a third bedroom in the attic of the roof space. The kitchens, living rooms and first two bedrooms were quite large, all measuring 13′ 6″ x 12′ 0″. 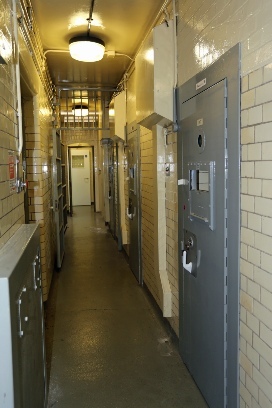 Detention room and four Prisoner Cells were constructed to very strict security guidelines. 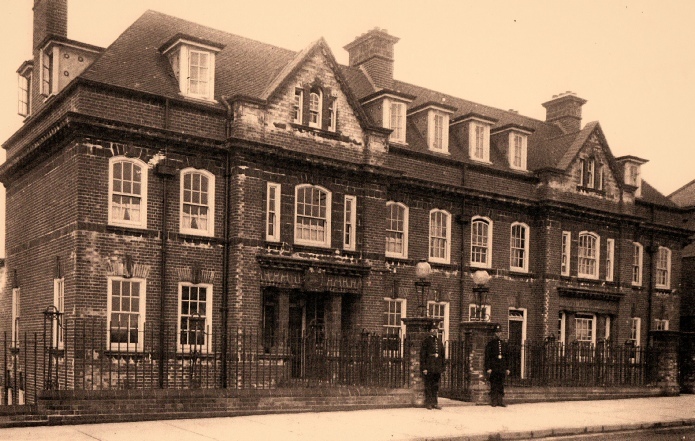 A Magistrates Court was built at the south end of the building but this was later demolished after being relocated within the Harwich Town Hall complex on the quay. Gardens were created to the west of the main building along with a grass slope along the front of the building from the pavement down to the basement level. A small footbridge, flanked by two pillars at the entrance and adorned by police beacons, crossed this slope from the pavement to the public entrance of the Police Station. A similar footbridge, flanked by just two pillars, connected the pavement to what used to be the Inspector’s accommodation to the north of the building. The Sergeant’s accommodation was built adjacent to this with access via steps from the basement level at the front and rear. A fence was built along the South-east boundary of the site and walls were built along the North-west and South-west boundaries. Unlike the previous three areas around which the town has developed. Bathside is not a natural centre but a clearly defined residential unit with a strong social character and so is therefore worthy of comment. The physical barriers which contain and define the area, the railway to the south east and the mudflats to the North West, are extremely strong. The railway, although bridged by level crossings, divides Bathside from the town beyond and therefore essential facilities which service the Area. The steep earth bank, which runs along North West perimeter, Shelters the area behind from the wind which blows across the open expanses of mudflats. The railway, built in 1854, came before the houses which followed several Years later as the street pattern which conforms to the subsequent shape of the area, suggests Bath side derived its name from the baths which were located out on the Mudflats .these baths were originally set up in 1761, but with the coming of the railway which cut them off from the town beyond, and the opening of the rival baths in Dovercourt by Tolly Cobbold, the brewers, they steadily Declined and soon ceased to exist. At one time, bathside supported a variety of small industries and commercial concerns. they had several slaughter houses at the south west end which have all now disappeared, a shipyard, a coalyard, sawmill, soft drinks factory and the gas works. 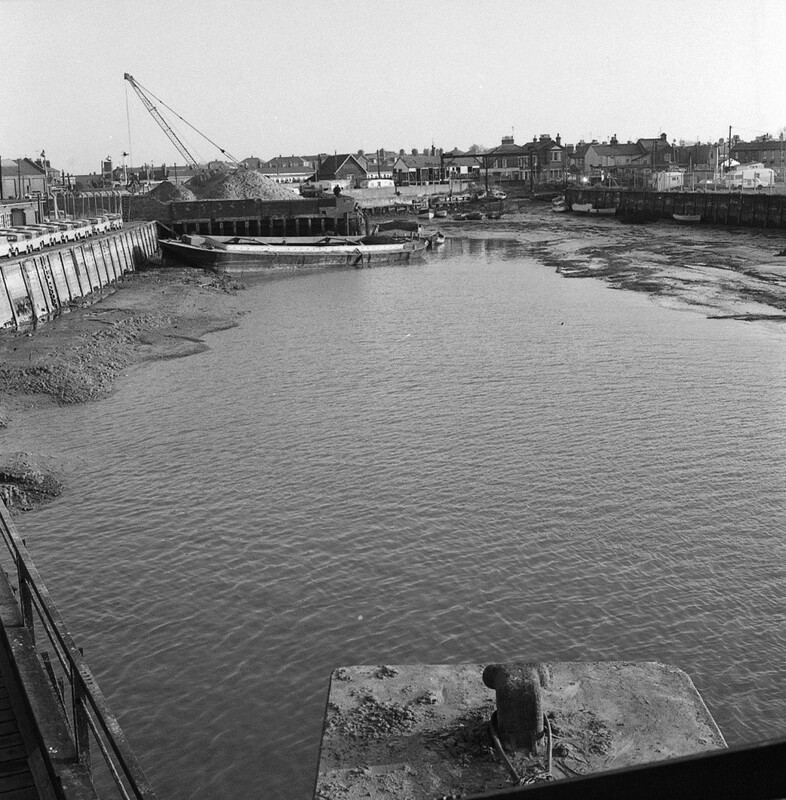 Much of the decline of the industrial and commercial activity can be attributed to the 1953 floods which devastated the whole area, but caused Particular hard ship to bath side which lies very near sea level. During the floods the entire bathside was evacuated, and many of the Population, especially the young families never returned, preferring to remain in the developing outer areas of Dovercourt. In 1863 Trinity House erected two cast iron lighthouses on the beach. They were used until 1917 to guide ships around Landguard Point; the two lights aligned indicated the right course. the deep-water channel is now marked by buoys. the lighthouses were restored in the 1980s and are sometimes known as Dovercourt Range Lights. The Lighthouses are 150 yards apart and were leading lights, they worked as a pair; with one light positioned over the other. the vessel was then on the correct course. The Low Lighthouse is a 45ft (16.5 metre) high, ten-sided tower of brick. The ground storey has a projecting canopy to provide public shelter. The High Lighthouse is a 90ft (32.8 metre) high, nine-sided tower of grey gault brick. The lighthouses were built 9ft (3.3 metre) to the south west of the original sites. The old wooden Low Lighthouse was built by the beach and is portrayed in one of Constable’s paintings. 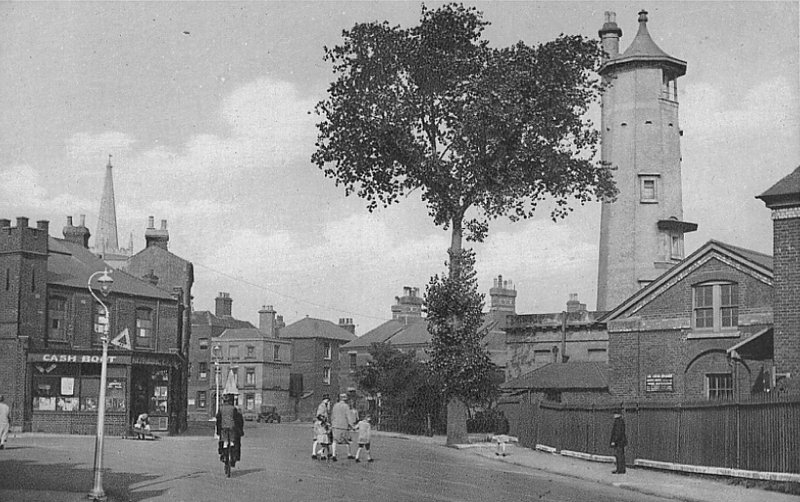 The High Lighthouse was over the Town Gate (on the Felixstowe side of the present High Lighthouse). Both earlier lighthouses were coal fired. 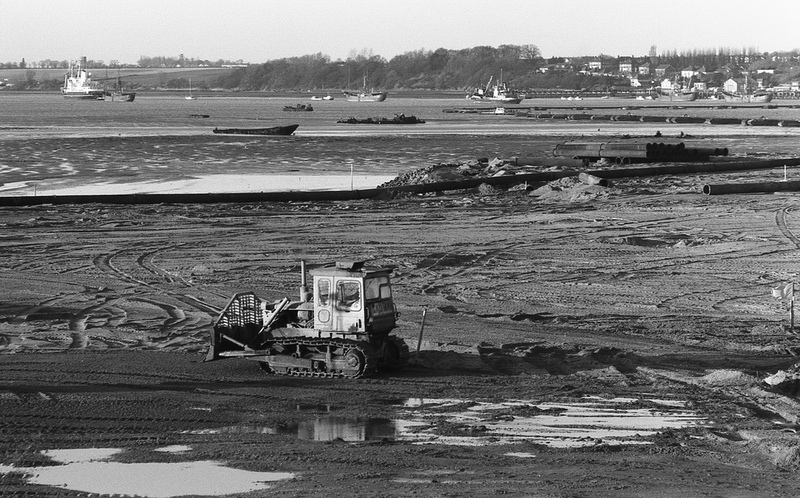 As a fashionable 19th century Seaside resort and spa town it drained Harwich old town of most of its Wealth. 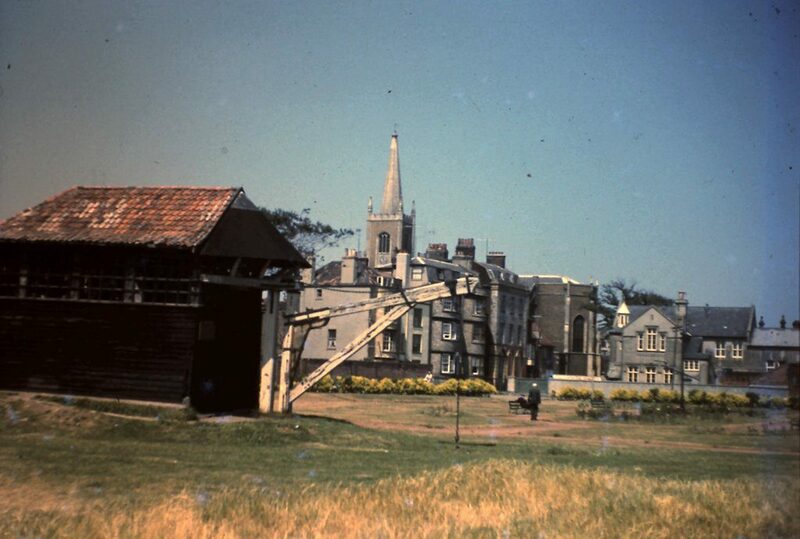 as Dovercourt became more fashionable so Harwich became less so, And as the poorer sections of the population remained so the quality of the Environment in the old town deteriorated. 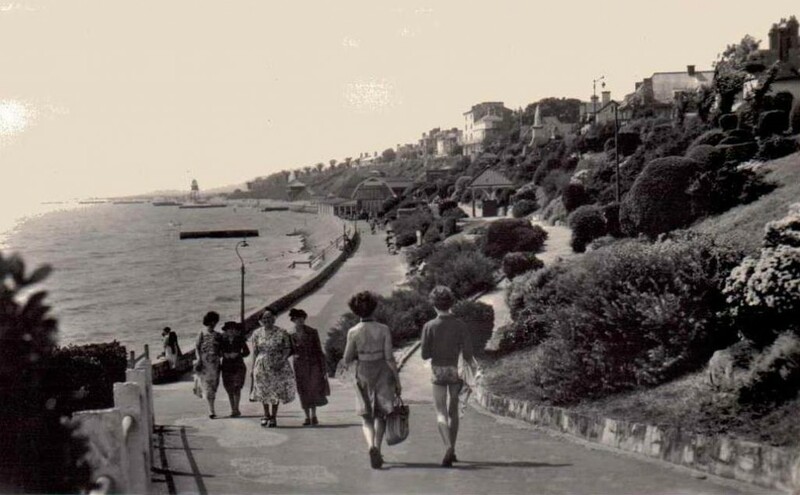 The high street and the promenade run parallel, almost immediately behind one another with the advantage of giving the visitors staying in the Hotels along marine parade easy access to both pleasant beaches. The main road, whilst being sheltered from the weather, is also sheltered from a view of the sea. Although from the junction of high street and Kingsway, the sea is barely 100 metres distant; one remains totally unaware if the saltiness in the air Dovercourt has the atmosphere of a reasonably prosperous small inland Town, with little evidence of its proximity to, and close association with The Sea appearing along the high street. But the sight rise in the land away from the road denies passing traffic All knowledge of existence. Much as they were 1000 years ago. The homes have changed, and the road has been improved but the centre still retains something of its Original village atmosphere. The actual fabric of upper Dovercourt has developed as a strip alongside the main road .beyond most of the strip is open country. The spreading Residential development, threatening at the far end to engulf it, has been generated by the development of lower Dovercourt. Thinking of Home by David Ling. 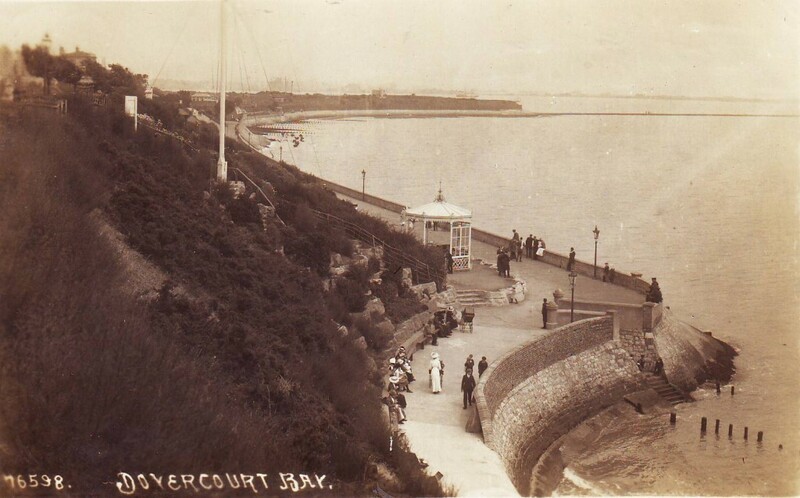 To the town where I was born – how I miss old Dovercourt Bay. Take me along the windy prom to tangle up my hair. With Queen Victoria watching on in a very sombre mood. At a summer dance on a Saturday night the luckiest day of my life. A go on the swings and down the slide, then be on my way. But for all I ever caught there they didn’t have much fear. Where I watched her go down in a gale one day, she lost the will to float. The follow your nose up a side street for delicious fish and chips. Where the French teacher gave me my nick name for acting like a fool. 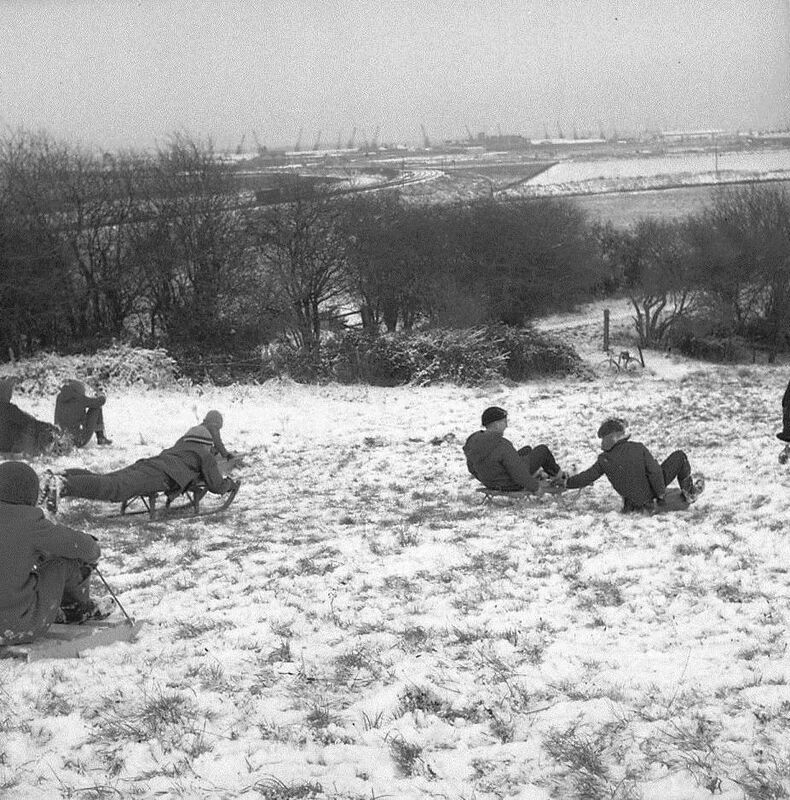 On the few snowy days in winter sledges flying what a thrill. After that stroll through the Hangings at dusk when bats invade the sky. And down a couple of English ales to soothe away my pains. Spenty many years there cooking for the boys of the school. They used to have a smashing Fete though it rained as a rule. Where if you’re lucky daffodils to make floral scene. The Skating rink – Putting green, the Boating Lake that I’ve Dreamed about quite often in the years I’ve been away, Then I’ll be back where I started on my Odyssey today. As Harwich and Dovercourt continues to change and grow, so will our knowledge and understanding of its history.